Joie de vivre, along the Seine River. The Poolhouse Project’s actors and I are getting ready for Fringe Festival which will happen the first week of July. I’ll take part of it virtually since I’m in Europe. We all wrote our own story to perform during the festival. It’s very funny. I shared one of my audition nightmares with them from back in the year 2008. I’ll share it with you once the festival is over. I don’t want to spoil the fun. 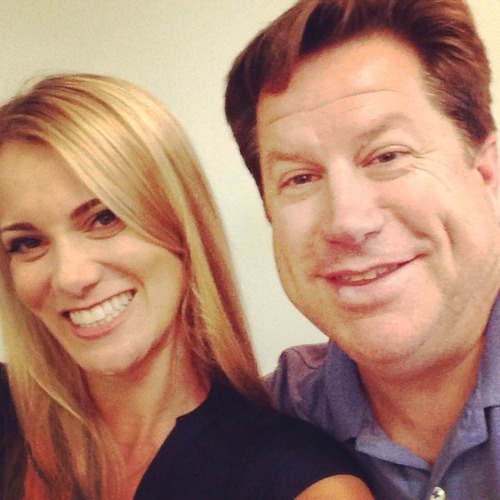 I took a workshop with Ty Harman, he is a casting director mostly on Disney Shows and for ABC. It was interesting. I was happy to hear that he had worked on many projects in France and still is. He and his wife really enjoyed staying for more than 6 months in Paris and working with international talents. I told him about a play my husband and I have been working on with the help of the Poolhouse Project, about my hosting work with Brand USA/Discover America and the upcoming feature film Zero in which I’m involved. His feedback was interesting. With Casting Director Ty Harman. I had a few things to wrap up before leaving for Europe, so I went to the last Improv class I signed up for and recorded a voice over I was hired at the last minute to do. Next was the heartbreaking step of dropping our pets to my in laws and then my husband and I took to the air on our way to France! The World Cup is playing on the mini screens. Switzerland – Ecuador! Go Switzerland!!! Paris, je t’aime et t’aimerai toujours (Paris, I love you and always will)! We landed there and were just like a fish in the sea. We got together with my side of the family, with old friends, enjoyed the café culture, the art, the pace, the bakeries, the window displays, the fashion 🙂 etc. We walked a lot. It’s what I miss the most in the USA although I really enjoy when I get the time to go for long walks on the beach. Photo fun at the Parc des Buttes Chaumont. This is where my parents would take me on a stroll when I was a toddler. Here with my husband. Then it was time to meet with some of our friends from the USA in Brussels for some delicious waffles and beers. 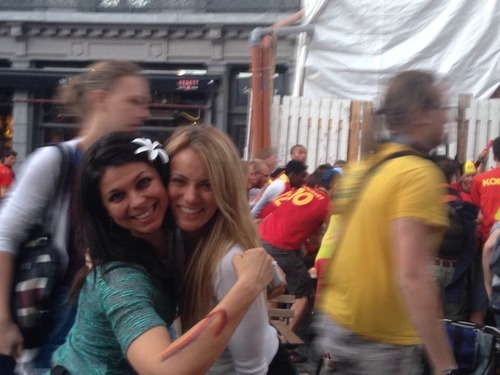 It coincided with the World Cup when Belgium was playing against Russia. 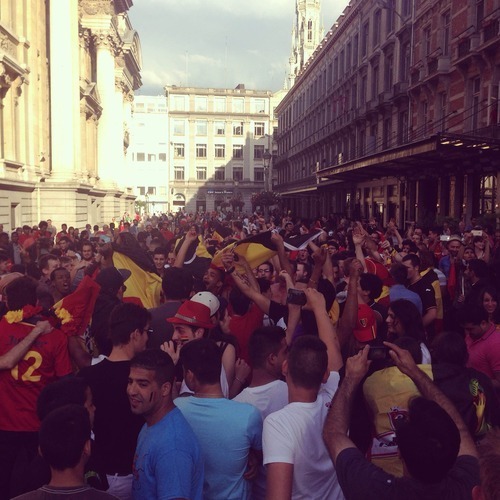 Belgium won – the town of Brussels was ecstatic! To top it off, I randomly ran into a classmate, Julie from the Cours Florent in Paris that I hadn’t seen for 4 years. We made sure to catch up the following day. We also visited Bruges. Belgium is celebrating its victory against Russia. I’m now sitting on the TGV to Switzerland, my heart is pounding as I’m about to see the rest of my family, many of whom I haven’t seen for a year and I miss their presence. Hugs time! 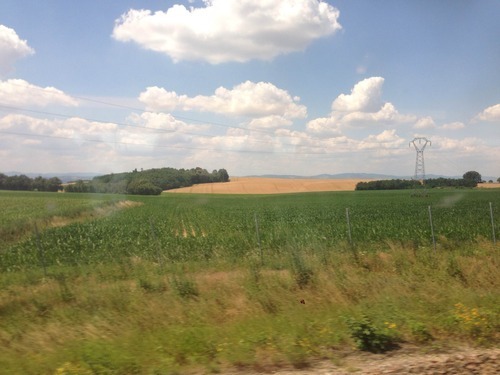 On the train “TGV” to Switzerland. Next Oh my! Caroline Amiguet San Diego’s shining star!